If you can provide an image of a grave I have not yet photographed, please send it to me at danamangham@hotmail.com so that I may add it to this webpage! I can provide you further info on finding the graves & graveyards if you can go there & take the photo! "They sleep beneath the mockingbird. . . ."
Momentarily "Shenandoah" will load for you to listen to while you peruse the pictures. . . Thanks to Eileen Mangham Honeycutt, a great-granddaughter of Nat Mangham, we now have a photo of his actual burial place in Kaufman, Texas. Thanks! Note: Bob's service in the war is unproven, but the best evidence indicates he spent at least some time with his brothers in the Army of Northern Virginia. Thanks to his descendant Ray Mangham, here's a photo of Bob's resting place in the old family cemetery in Pike County. (Note: John's place and date of death are unknown, although some evidence indicates that he died in Alabama. I recently found evidence that he was alive and in business in Griffin, Spalding Co., Georgia, as late as 1880. If anyone knows his grave's whereabouts, please contact me! 2nd Ga. Batt. & 30th Ga.
2nd Lieut. 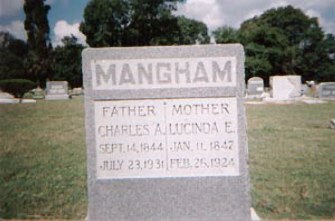 John C. Mangham, Jr.
John is buried in Linwood Cemetery, Columbus, Muscogee County, Georgia. He was the eldest brother of Sam and Tom Mangham (see above). John served in the Mexican War as a sergeant in the 1st Georgia Vols., was appointed a 2nd Lieut. in the newly-raised 13th U.S. Infantry, and finished his military service as adjutant of the regiment. Born July 24, 1824, John died Nov. 18, 1851. Their mother Ann is buried next to John, Jr., and his sister Ann A. (Mangham) Ellis. 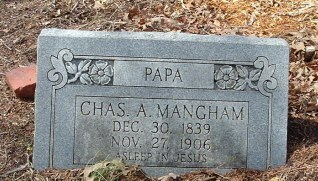 Can anybody find a picture of his father's grave in Butts County? 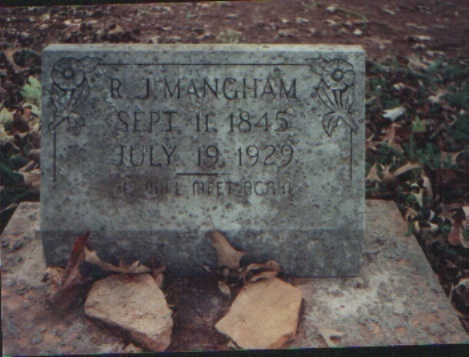 James M .Mangham served in the Georgia Militia in the War of 1812, and died in the late 1860s. Well, the mystery continues! John Henry Mangham, who seemed to go by "Henry" in the 1850 census, wound up drawing a pension for many years as "William H. Mangham." That's especially strange, as his brother (?) William A. Mangham already bore that first name. 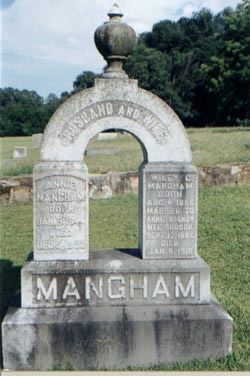 After "William H. Mangham" died in 1910, he was buried as a Confederate veteran. Both William A. and John H./"William H." were privates. Now, the mystery is: how and when did the name on his monument get changed to Willis, with the rank of sergeant? 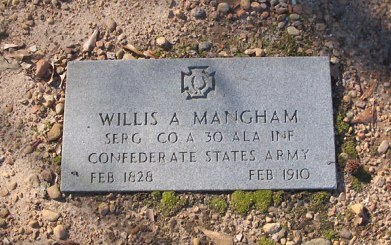 (That's the name & rank of a very well-documented brother who served in Company A, 30th Georgia Infantry; Willis enlisted back in Butts County, Georgia, where "William H. Mangham" was born in 1828, according to pension records. This veteran rests in Oakwood Cemetery, Montgomery County, Alabama. Mayrant: 3rd Ala.; 22nd Ala.
Case: 5th Ala. and/or 8th Ala.
Chandler: 32nd Ala.; 36th Ala.
Sibley: Barlow's Ala. Co., 15th C.S. Cav. Rapier: 7th La. & La. Zouave Bns. Photo needed!! Pending determination of his place of interment, here is a picture of his son William's grave [left], alongside William's wife, Lucy Pauline Mangham. They lie in the city cemetery in Yazoo City--Frank & his wife are likely in a nearby Methodist cemetery, or else their grave markers have decayed or been removed. Can you help? 1st Ala. Bn., 25th Ala., 10th Ala.
Sgt. Arthur Green Mangham, Jr.
11th La. Bn. & Consolidated Crescent La. Regt. Note: Thanks to Tim Burgess for this photo (below, left) of the Confederate monument in Mt. Olivet Cemetery, and to Troy Groves, whose Terry's Texas Ranger's website provided the information that John is buried here. He and hundreds of his comrades died of measles in 1861, and most of their individual graves are unmarked. Go to Troy's great webpage at tn_mt_olivett.html. 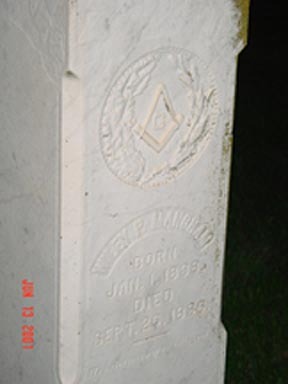 John is listed in the cemetery records as "Joseph R. Mangrum," which mixes his cousin's first name with the "Mangrum" spelling so common in Tennessee. His cousin, Joseph M. Mangum (note spelling), was discharged from the same company (due to illness) just day's after John's death. Joe returned to Texas, later soldiered in other units, and lived long after the war down in Gonzales County. 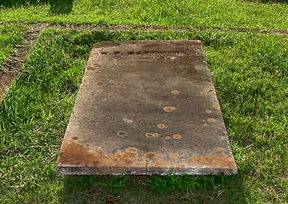 Thanks to his descendant Beth Parsley, here is a picture of Joe Mangum's final resting place. He lies with his wife Mattie under a beautiful old oak tree in Gonzales County, Texas. It's nice to reunite these cousins who parted so sorrowfully back in 1861. (Photo courtesy of Andrea Scioneaux. On July 28, 2002, our branch of the Mangham family lost another veteran. My father, Jesse Roger Mangham--always Roger or J.R. to friends and family--passed away while visiting his sister and other relatives in Decatur, Georgia. A resident of Baton Rouge, Louisiana, since the early 1950s, he was born in Plains, Sumter County, Georgia, on Nov. 18, 1922. He was raised in Columbus, Muscogee County. He was a veteran of the US Army Air Forces in World War II. The picture of him (below) was taken while on leave or pass in Atlanta, either in 1944 or 1945. He and my mother, Ethel Shealy Webster of Talbot County, were married in Atlanta on June 6, 1943. He is buried in Baton Rouge.